I have an armadillo. No, not like a pet or a novelty purchase, I have an armadillo living in my backyard. Well, at least at night he lives there, randomly digging three-inch holes in the soil and making my yard look like a miniature mining town from the 19th century. He's quite industrious. When the small holes began to appear, I originally blamed the neighbor’s cat, who has a penchant for using my yard as a litter box and frantically digging to cover her treasures. As the holes began to multiply exponentially, I wondered what in the hell that cat could be eating to have a need to relieve herself that often. Only when looking out the patio door at 4 a.m. on a sleepless night did I see the real culprit of the mini-bunkers in my yard was the helmeted critter with a face only a mother could love. I stepped onto the patio and rattled a chair against the concrete to startle it, and it scampered off to the other neighbor’s storage building and shimmied underneath. I’ll admit it was hard to be mad at the thing after seeing what it looked like trying to run. He’s after the grubs, the same grubs that the moles targeted in past years, leaving long lines of the rodent underground railroad just below the surface of the lawn. The moles, when they had control of my yard, burrowed through the soil and raised little mounds just high enough to hit the lawnmower blades and erupt in a cloud of dust during the weekly mows. They must be more showy creatures to ensure their presence is announced with a dirt version of fireworks. I was glad the moles did not appear this year, and my yard remained relatively level, devoid of the crisscrossing molehills. Then the holes began to appear. They were unassuming at first – the size of a lemon here or a grape there -- with the telltale sprays of dirt around the edges indicating something dug it out. Now they have reached the size of grapefruits as the armadillo becomes much more destructive in his nightly excavation. Perhaps he’s bringing friends I have yet to see. Yet, through all of this, I’m not complaining. I’m observing. Honestly, I am not so connected to my lawn that I must maintain it in a pristine state. I do not play croquet out there or have kids running hither and yon, I simply walk the dogs and occasionally enjoy the view from a comfortable place on the patio. It does not have to be perfect. I mow it, I trim the edges, and I weed the flower beds. I am neither a trashy yardsmith nor a meticulous one. Sure, I could get rid of the food source the armadillo is so desperately searching, or I could find a permanent means to end the critter’s nightly forays for good. Or, I could just accept the fact that I live rurally, and part of that means sharing my yard with whatever critter needs to be there at the time. He's not hurting anything, really. In a perfect world I could have a pointed conversation with the varmint, convincing him that the pasture behind my house would be better suited for his midnight forages. Since that time will never come, I chose to simply live with it. 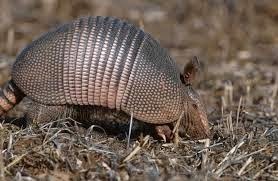 I chose to share the space with this armadillo, despite my dislike of his housekeeping abilities, and know that someday, he will move to another place where grubs are plentiful and the dirt is more suited to his taste. I chose to coexist with something a bit unappealing now, knowing that someday, the scene will change. Aahhh, I LOVE this blog, Rita! I wake up most mornings to signs of all sorts of extracurricular evening activities in the backyard. If only I had a night vision camera. I often wish that the critter(s) would find another yard to party in, but then again, it's pretty fascinating knowing something is going on. I saw it again last night -- it was out early, about 8 p.m. here. This is only my third time to see it, and it's been nearby about four months (at least, that's when the holes began to appear). I stood on the patio making all sorts of noise, trying to get it to move, but it just searched the dirt about 10 feet from me, completely ignoring me. Finally, it noticed me and took off down the hill, looking almost like a cartoon as it ran. Imagine a rock with short legs that wobbles side to side as it moves forward. He's not going to win any marathons, but he sure puts forth a lot of effort.